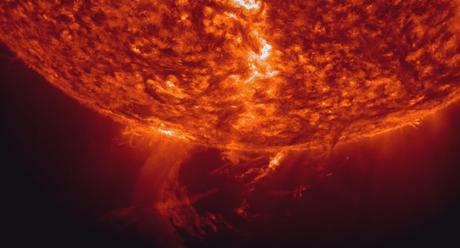 Recently, I came across a fantastic time lapse video with sequences of the Sun’s atmosphere observed by the Solar Dynamics Observatory spacecraft between 2011 and 2015. The music “Una” by Murcof (from the Album Utopía, 2004) fits very well with the scenes of solar eruptions. From viewpoint of the Wisdom Teachings, the essence of the Sun and of ourselves is but one and the same. We are no different from our Sun. You are the son of Prajapathi. You are lone ranger of the sky. You are all nourishing and all regulating. Please withdraw your rays and brilliance. Here you can listen to the prayer or download the text.